The number of children "up for adoption" has fallen. Correct. 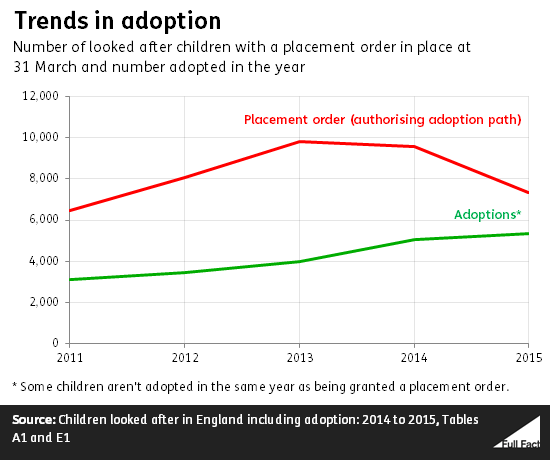 The number of children granted a placement order - one of the first steps before a child can be adopted - has fallen by 24% in the last year in England. The number of completed adoptions has continued to rise, but at a slower rate. "Number of children up for adoption plummets by a quarter in a year"
"Cameron's flagship children's policy 'faces crisis' as adoption figures fall"
The Coalition government introduced a series of reforms which sought to reduce delay in the adoption system and to facilitate more adoptions. Newspapers last week claimed the policy was "faltering". One of the first steps before a child can be adopted is called a placement order. The papers are right to say the number of children granted these has fallen in England. The Department for Education puts this down to two high profile court judgments, which the National Adoption Leadership Board says have been misinterpreted by local authorities. This decline has not shown up in the number of children being adopted, which has continued to rise, albeit at a slower rate. The government has seen more success in the shortening of the average time between a child entering local authority care and being adopted. This has been falling since 2012, from two years and seven months in 2012 to two years and three months this year. A court typically must approve a 'placement order' before a local authority can pursue adoption and a child can go and live with potential adopters (or the parents of the child have to formally agree). The number of placement orders approved has fallen by 24% in the last year, from about 9,600 in March 2014 to 7,300 this March. There were some signs of this trend in the previous year, when it fell by about 2% from 2013 to 2014. Once a child has had a placement order approved, the local authority can then find a family for them. Once they go to live with this family, they're counted as being 'placed for adoption' until they're granted the final 'adoption order' which means they're legally adopted. The number of children placed for adoption has fallen too, by 15% over the past year. We don't know whether the fall in placement orders is down to fewer local authorities applying for them or due to fewer applications being granted. Figures from the Adoption Leadership Board suggest it might be a bit of both. The government points to concerns raised by the National Adoption Leadership Board that misinterpretations of two high profile court judgments on care and adoption cases have led to the decrease—for example the interpretation that the judgments mean there now needs to be more detailed assurances that adoption is the best option. The Board published a guide for social workers on the judgments in 2014 which stated that they "in reality, do not alter the legal basis for the making of care and placement orders". But the President of the Family Division of the High Court, Sir James Munby, has stated that the cases spell out "just how stringent and demanding" the existing law is. We don't know why these cases have affected the numbers—or if it's definitely these cases that have led to the decline. It may be that they've simply given local authorities a better understanding of the law in terms of what evidence is required for adoption to go ahead, even if they didn't actually change the amount of evidence that's required. Or perhaps it's made social workers more hesitant to pursue adoption if they feel it's likely to be unsuccessful. Or it could be that they're becoming more likely to pursue other options, like special guardianship orders (which maintain the legal relationship between the child and their birth parents). The use of special guardianship orders has been increasing. 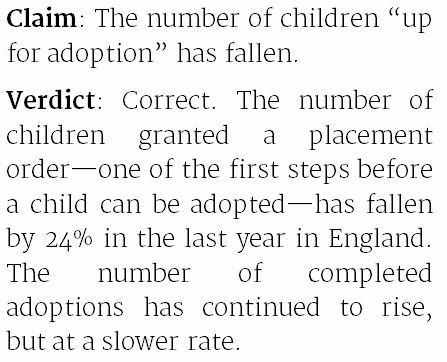 This decrease hasn't shown up in the figures for the number of children adopted (those who have had an adoption order approved). The number of children adopted continues to rise, but at a slower rate than before. It increased by 5% between 2014 and 2015, compared to an increase of 26% the year before. We've clarified that the figures refer to England. We said there had been 9,600 placement orders approved "in the year to" March 2014. To say it was "in the year to" is incorrect because the figures relate to the total number of orders approved at any one time rather than the number approved in one year. The article has been corrected to say there were 9,600 orders approved in March 2014.